During the last weekend of June, Garden Bloggers from all over the country descended upon the Bay area for three days of garden tours and fun. We stayed in the heart of the city the weekend of Pride, just after the Supreme Court said no to Proposition 8. Our hotel, The Westin was just a block away from the parade. I felt honored to be where history was playing itself out as people were celebrating their newfound freedom. I was ecstatic for them! We bloggers weren’t the only ones in town. People from all across the country descended upon the region, to usher in a new era of civil rights. They said over a million people were in the city that weekend. At the same time, the region played host to the hottest days, with heat warnings issued for the weekend and record-breaking temperatures being set throughout the Bay area. Fortunately, we had air-conditioned buses that drove us from garden to garden and when the heat turned up, we grabbed our cold drinks and plopped our sweaty bodies down into whatever seats were available. We found luxurious comfort in cooling ourselves down in the longer drives between each garden. It was a challenge to take photographs during the San Francisco Garden Bloggers Fling tour. I decided to begin this story with my outtakes. I know. I know. It is a backwards approach. Between the heat and the frustration of being hindered getting some decent photos in the amazingly bright light, the outtakes are as much a part of the story. When the light was high overhead, I found myself photographing mostly in the shade when I could. Some photographs I took regardless that the light was poor. When I returned home, I opened up Photoshop and played with the not so stellar photos to see what lemons I could make sweet! 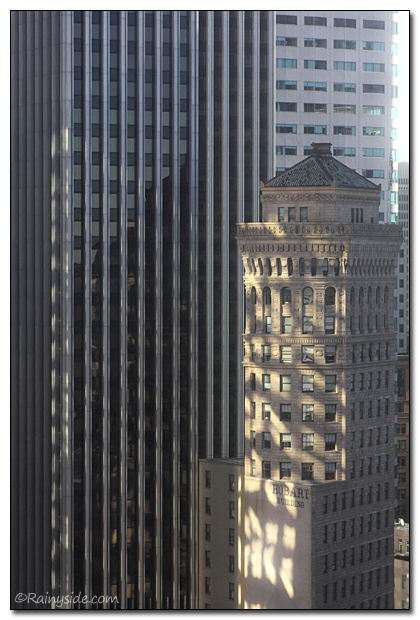 Here are my outtakes of what I found interesting during my I-had-a-fling in San Francisco. In an urban inner courtyard garden designed by Organics Mechanics I found this chair in a far corner. 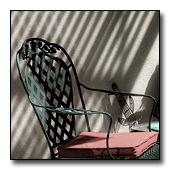 A fire escape from the apartments that surrounded this garden cast a beautiful shadow across the stucco wall. In this urban Matt Gil Sculpture Garden, one of the walls of a neighboring building is covered in corrugated steel. 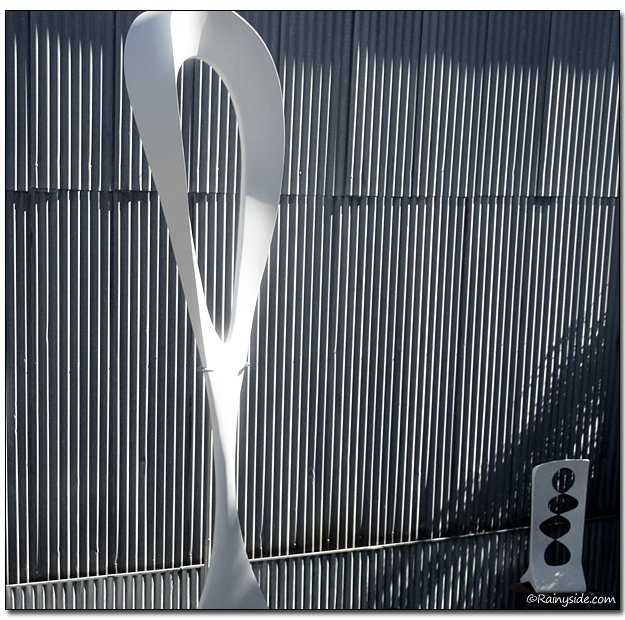 The sculpture rises high above the ground and the play on light with the steel and sculpture made photographing in full sun a pleasure. For perspective on how big this sculpture is, corrugated steel comes in four by eight foot sheets. (There are plants in this garden, just not in view of this image.) If you stare at this long enough, you start to see rainbows. Or do I need my eyes checked? 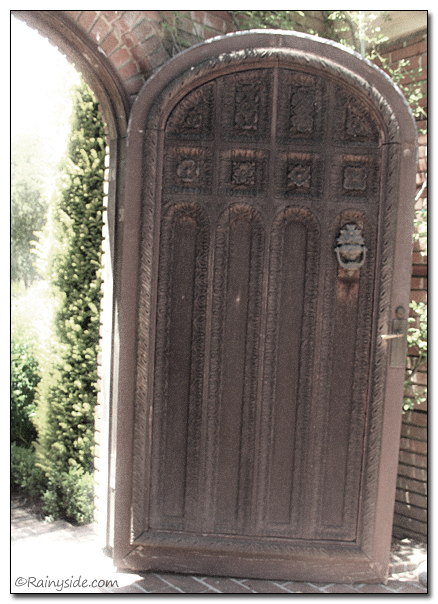 This beautiful ornate gate in the Filoli Gardens transitions between a courtyard to a more open area. 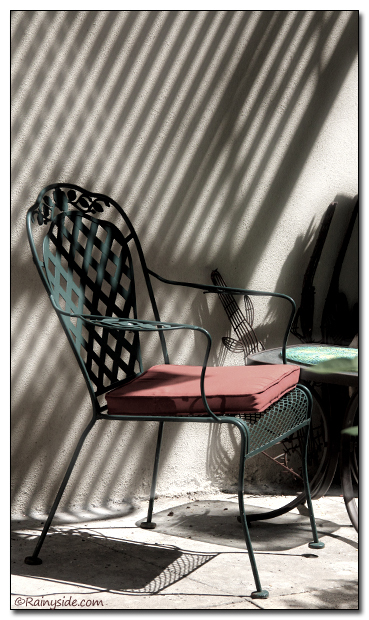 What to do when the object of desire is in full shade with bright streaming light all around it? I chose to make it look like an old photograph reducing the contrast by a lot and only showing just a hint of color. At Annie’s Annuals and Perennials not only is this nursery stuffed with fantastic plants but the painted walls inside the fortress, really are fun. 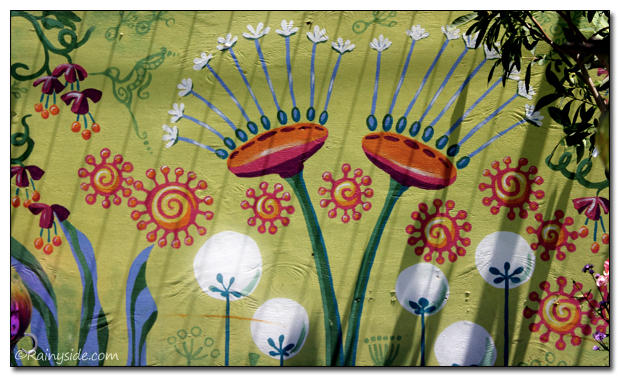 I liked the shadows that were cast on this wall, adding another dimension to the brightly painted scene. 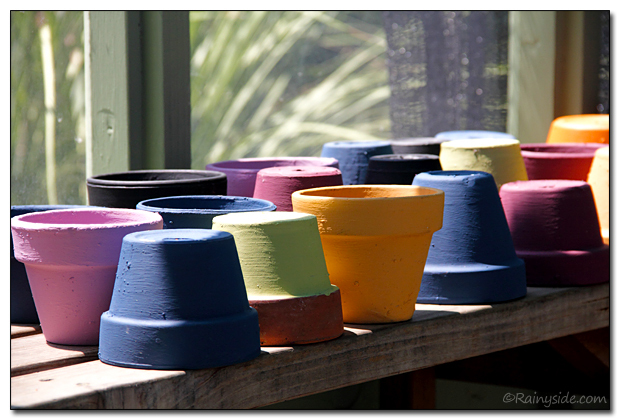 These painted terra cotta pots lined up artistically in rows was found in the Ruth Bancroft Garden’s greenhouse. I loved stumbling upon this, and thought if it weren’t for all the plants I winter over in the greenhouse, I would have these pots all lined up on my benches. 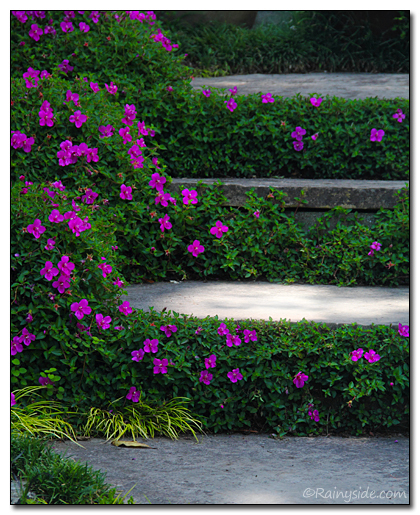 Since this is part of a garden tour, I should show some plants. We reached the Nichols garden and found a lot of shade on one side going up to the backyard. As I went up the stairs, I noticed the spot of light on one of the steps. Although I was hoping for more shade all day, here this spot of light, gave an extra dimension to the blossom engulfed stairway.